This is the first game in the The Walking Dead series. 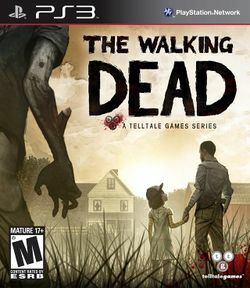 For other games in the series see the The Walking Dead category. The Walking Dead (also known as The Walking Dead: The Game) is an episodic point-and-click adventure video game for iOS, OS X, Microsoft Windows, PlayStation 3 and Xbox 360, based on Robert Kirkman's The Walking Dead comic book series. The game was developed by Telltale Games and was initially slated for release in the last months of 2011, but was held back until early 2012 to allow further time for development. The game consists of five episodes, released between April and November 2012. The iOS version of each episode followed shortly thereafter. Telltale has also published retail versions of the complete game. The game takes place in the same fictional world as the comic, with events occurring shortly after the onset of the zombie apocalypse in Georgia. However, most of the characters are original to the game, which centers on university professor and convicted murderer Lee Everett, who helps to rescue and subsequently care for a young girl named Clementine. Kirkman provided oversight for the game's story to ensure it corresponded to the tone of the comic, but allowed Telltale to handle the bulk of the developmental work and story specifics. Three characters from the original comic book series make in-game appearances; Hershel Greene, Shawn Greene and Glenn Rhee. Unlike many point-and-click adventure games, The Walking Dead does not emphasize puzzle solving, but instead focuses on story and character development. The story is affected by both the dialogue choices of the player and their actions during quick time events, which can often lead to, for example, certain characters being killed, or an adverse change in the disposition of a certain character or characters towards Lee. The choices made by the player carry over from episode to episode. Choices were also tracked by Telltale, and used to influence their writing in later episodes.